The Stanford d.school, which opens officially on May 7, is a space whose design has been refined over the course of six years to maximize the innovation process. The Stanford d.school, which opens officially on May 7, is a space whose design has been refined over the course of six years to maximize the innovation process. Every wall, every nook, every connecting gizmo, every table, every storage cabinet, has been created with a grand, collaborative vision in mind. Nice for them. But what about the rest of us, out here in standard-issue cubicle land? Are we all destined for subprime collaborative work lives because our office spaces and furniture are so numbingly left brain? Not so, says George Kembel, the executive director of the school. Even if your company doesn’t have a few million to throw at making your space more innovation-friendly, there are things you can do to optimize what you’ve got. The d.school team sat down and brainstormed 11 great ways to transform your digs into a little hive of bubbling creativity–or at least a place that manages to capture the occasional good idea. 1. Start with what you have. “We started in a trailer,” Kembel points out, “with the ‘d.school’ as a sign on the table.” Kembel’s advice: Claim a space and label it. 2. Go to the people who are interested first. Form a crack team of true believers to spearhead your campaign. Revolutions start from the bottom up. 3. Empower your team to change their space. Somebody high enough up the food chain needs to defend this activity against facilities managers who may not be amused. Then, be willing to keep changing things. 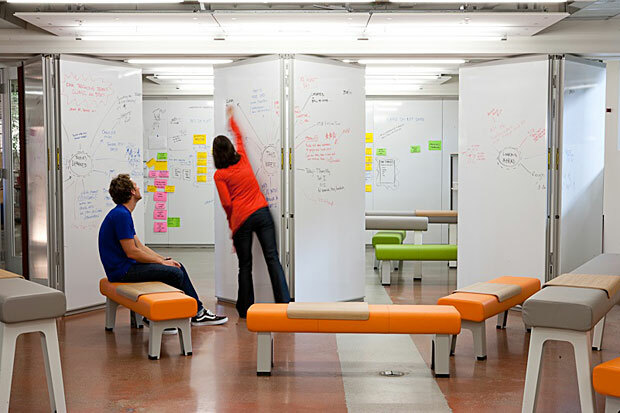 Try out different ways to configure space to see what works best. 4. Watch the behavior of the group and take notes. Have somebody in your band of innovators own this task. What’s working, what isn’t? “Try, reflect, modify,” says Kembel. 6. Keep any prototypes, sketches, or idea-jam artifacts low-rez and not precious. “Don’t get too formal too fast,” says Kembel. Making things precious locks them in too soon, short-circuiting potential improvements. 7. Show your work in progress. “Put your underwear up on the line and let people comment. But keep it safe,” Kembel says. No rude comments allowed. 8. Do something simple to surprise people. 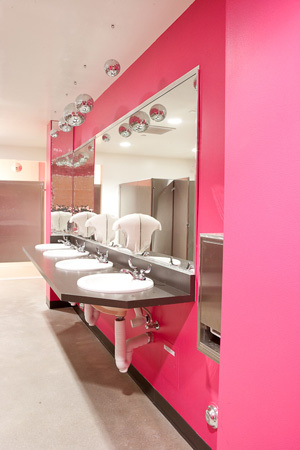 At the d.school, they painted the women’s restroom lipstick pink, and hung disco balls. “That makes people realize that somebody cares about your experience,” Kembel says. 9. Invest more in “we” spaces than in “I” spaces. Cozy nooks for teams, not plush corner offices for the alpha dogs. 10. Mix up seating options. Take the table out of the room and sit on the floor. Vary seat heights. Change customary positions at meetings. For example, put the group leader in the middle, instead of at the head of the table. Try holding a meeting where only standing is allowed. In general, work to lower status markers. 11. Make idea generation and capture easy. Any non-porous surface can be a whiteboard, says Kembel. Buy a sheet of sheer acrylic at Home Depot and mount it on a wall as a writing space. Keep markers handy. Put prototyping tools out where people can grab them when an idea strikes. “Creativity follows context,” says Kembel. The main idea, he says, is not to segregate creativity from other activities. “You don’t need to be fancy to do it,” he says. 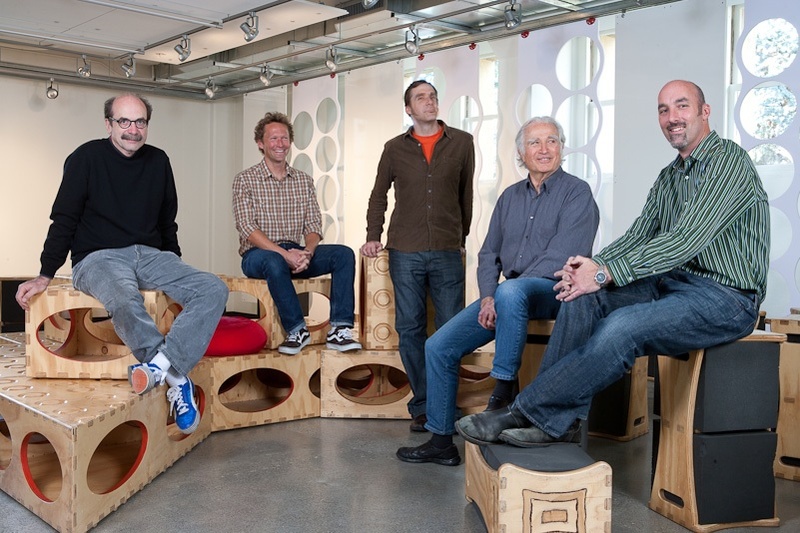 d.school principals (l to r): d.school founder David Kelley, Environments Collaborative co-directors Scott Witthoft and Scott Doorley, academic director Bernie Roth, and executive director George Kembel.